The return on investment ratio (ROI), also known as the return on assets ratio, is a profitability measure that evaluates the performance or potential return from a business or investment. The ROI formula looks at the benefit received from an investment, or its gain, divided by the investment's original cost. ROI serves as a returns ratio, allowing a business owner to calculate how efficiently the company uses its total asset base to generate sales. Total assets include all current assets such as cash, inventory, and accounts receivable in addition to fixed assets such as the plant buildings and equipment. If an investment doesn't have a good ROI, or if an investor or business owner has other opportunities available with a higher ROI, then calculating the ROI values on the different opportunities can instruct him or her as to which investments to choose for the best return. Many analysts and investors like to use the ROI metric because of its versatility and simplicity. Essentially, it works as a quick gauge of an investment’s profitability, and it's very easy to calculate and interpret for a wide variety of investment types. 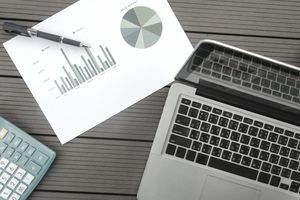 You can determine ROI in different ways, but the most frequently used method involves dividing net profit into total assets. The return on investment ratio is also called the return on assets ratio because that investment refers to the firm's investment in its assets. where Net Income comes from the income statement and Total Assets come from the balance sheet. To interpret the ROI percent results, collect appropriate, comparative data such as trend (time series) or industry data on ROI. The business owner can look at the company's ROI across time and also at industry data to see where the company's return on investment ratio lies. The higher the return on investment ratio, the more efficiently the company is using its asset base to generate sales. Say that Joe invested $1,000 in his start-up, Joe's Super Computer Repair. He has a buyer for the business for $1,200. The ROI for this equals Joe's profit or $200 divided by his initial investment, $1000, for a 20 percent ROI. Joe also invested $1,000 in Sam's New Computer Sales, and a buyer is looking to pay $1,800. The ROI for this equals the $800 profit divided by his investment of $1,000, or 40 percent. From this comparison, selling Sam's New Computer Sales appears to be the wiser move, with 20 percent vs. 40 percent. What the ROI formula doesn't tell you, and one of the short-comings of the ROI ratio is the time involved. This metric can be used in conjunction with the rate of return on an asset or project, which does consider the period of time. You can also incorporate the net present value (NPV), which accounts for differences in the value of money over time due to inflation, for even more precise ROI calculations. The application of NPV when calculating the rate of return is often called the real rate of return.